When it comes to fashion, we’re drawn to those who can design and design well. We’re also drawn to clothing that makes us feel good and that’s exactly what you get when you wear designs from Rc Caylan – Creative Director and Fashion Designer at RC Caylan Ateliér. If you have’t heard of him, you have now and we recommend you stay tuned because he’s been turning heads on the red carpet and has the attention of local fashionistas and celebrities alike. You don’t want to miss out! Rc Caylan is a fashion designer that offers customized bridal gowns, elegant evening wear, dresses and any occasion designs for both men and women and is located downtown Grand Rapids, Michigan. We sat down with him for an interview and fully enjoyed getting to know him and we think you will too! Read on and enjoy! DFN: Thank you so much for taking the time to speak with us today. Please, tell us how RC Caylan Ateliér was started. Caylan: RC Caylan Ateliér was built in 2016 of April. I was growing up back in the Philippines with a grandmother seamstress and my mom too. Since then I always liked anything and everything about fashion. In the Philippines we grew up in mostly catholic religion so it was hard for me to come out and be out to myself and show exactly what I was liking to do then. Moving forward, I had the chance and opportunity to work on cruise ships. I worked for the spa department and used to cut & color hair, do facial treatments and massages. It is where I met my husband. I then realized that working on the ship wasn’t really my calling. Fashion design was always my passion. Me and my husband decided that we will be going to live together in Grand Rapids, Michigan (I was born in Sterling Heights). When I moved here to Grand Rapids, I went back to school and took Fashion Merchandising & majored in Fashion Design here in Grand Rapids. I started internship hunting before my May graduation in 2015 and landed an assistant position for a known designer from the Philippines who has an Atelier (fashion Studio) in LA. 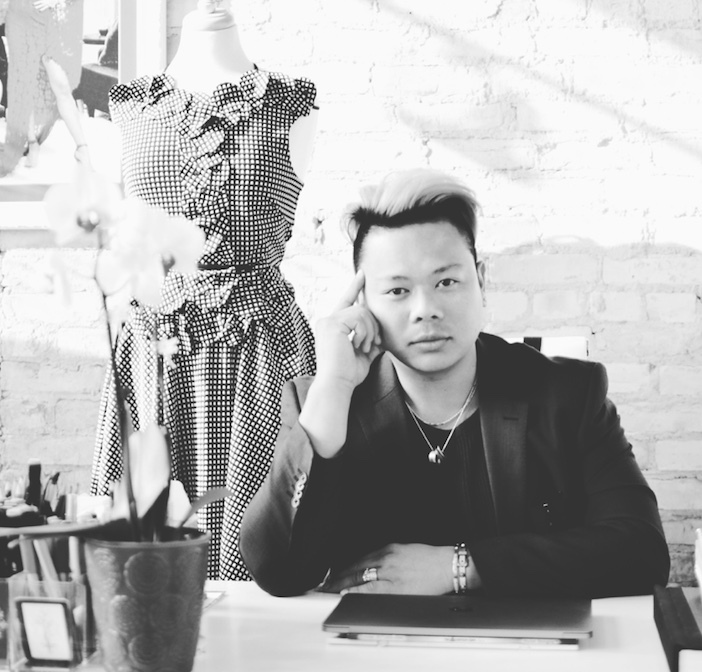 Fast forward, I met this amazing fashion designer who has been in the fashion industry for almost 25 years Joseph Domingo, who is based in SanFrancisco. He invited me to create my first ever mini collection to join other 24 world renowned and acclaimed fashion designers. The show took place at SOMA, San Francisco Museum of Art, hosted by San Francisco Bay Area Fashion Network. The show was held last September of 2015. It was indeed where my career in the fashion industry. DFN: Amazing story and kudos to you for following your calling! So obviously, you’ve always been very talented. At what age did you know you wanted to be a designer? Did the urge ever come before your cruise ship days? Caylan: At the age of 9 I was already in love with fashion. I loved sketching even that age. After working on the cruise ship and moving to Grand Rapids, thats where I started to listen to my inner voice and went back to school and took fashion design. DFN: You’ve definitely come a long way. Congratulations on your Vogue feature. How did that feel and was it extra special to you the publication was Edward Enninful’s first? Caylan: THANK YOU …. it does feel surreal to me. I guess you just have to believe in what you do. Having that break and being featured in one of the biggest fashion magazines in the world on their “fashion designer profile” is a lifetime of memories from my journey. It did help get my brand noticed. DFN: Well, we aren’t surprised about Vogue. It’s well deserved! Your designs are so glam yet so chic, perfect for the red carpet. How many celebrities have you dressed and who was your favorite to work with? Caylan: Thank you. All I know is, I am doing exactly what has been my calling. To be able to penetrate the industry this fast of my career is already a mind-blowing experience for me. At this point, 12 Hollywood celebrities have worn my designs already and one of my fave red carpet moment was for Anne Winters (DayTime Emmy award winner). She wore my plaid jumpsuit with an off shoulder sleeve and train. A moment like that was my absolute favorite because not only was an award winner wearing my design, it was more special because she won her 1st major award at the same time. DFN: Congratulations to you both! Do you have any other big projects or red carpet events of your own you are preparing for at this time that you can share with us? Caylan: Yes, I’m reaching a major milestone for my career as I am going to launch and showcase my new Collection Spring/Summer2019 for the upcoming New York Fashion Week powered by Art Hearts Fashion. My show will take place at Angel Orensanz in Norfolk, NewYork this coming September 8, 2018 at 7:00pm. If you wish to see my collection you can simply log on to www.artheartsfashion.com for tickets. DFN: What inspires you as a designer and why do you think women are so drawn to your designs? Caylan: The things that inspire me most when I’m doing a collection or in general is nature. You can find so much inspiration from the wind, flowers, weather and the abstract of everything. You just have to find the right interpretation and for me that makes my aesthetic having that emotional feeling. Women are drawn to my designs and creations because they feel comfortable with it. I also believe my aesthetic is timeless and it does not have to be for a specific occasion. DFN: How do you explain your new collection and what type of women wears your designs? Caylan: My new collection is inspired from my interpretation of love called “Hues Of Love SS2019”. When we love it is not only the color of red, theres also blue, pink, black, etc. The thought of loving is not all happy moments. It is a mixture of everything including emotional, spiritual, and social needs. Though this collection is inspired from “LOVE”, the silhouettes are still my modern classic aesthetic. I do believe that women who wear my designs are all fabulous, fierce and above all someone who’s not afraid of embracing their natural beauty and women with money (kidding aside). DFN: Tell us something about yourself that might shock our readers. Do you have any other talents, hobbies or rituals that keep you motivated? Caylan: Ooohhhh nooo… haha. This is something that will really shock the readers, hehe. Back in the Philippines when I was in my 20’s and in my college days, I used to work in a comedy bar and I do stand up comedy. I had a 26 inch waist and long hair. I guess it was because of the nature of my work. I used to sing and loved Whitney Houston and Mariah and would switch my voice to a woman-like voice. My current days are always the same though. I keep myself motivated by the people who love me including friends and family. I love cooking filipino dishes and sometimes other cultural dishes too depending on my mood! DFN: If someone wanted to wear your designs or shop for a dress for their next big event, how do they go about doing that? Caylan: I can be found on Facebook and Instagram @rccaylanatelierofficial. From there they can email me or call us. Or one can also simply log on to www.rccaylan.com to book for their personal consultation with me. I don’t do walk-ins, only by appointment. DFN: Do you have a specific price range for the items in your collection? Caylan: New collections are normally high and range from $1,200-$15,000, custom made items depend on my client’s wants, desires and needs. DFN: Are there any 2018-2019 local shows or charity events you plan to be a part of here in Michigan where our readers can attend to support you? Caylan: So far most of the shows that I have confirmed are outside Michigan unfortunately. On September 8, I’ll be at New York Fashion Week. September 29, Calgary, Alberta for Calgary Fashion and Art Week then October 11-14 I will be in L.A. for L.A. Fashion Week. I also have an on-going discussion for a charity show before the year end here in Grand Rapids but we will see. For more show updates follow me on my social media accounts to know what’s my latest. DFN: Thank you so much for your time today. It’s such a pleasure to be able to speak with you. Good luck at your upcoming shows!